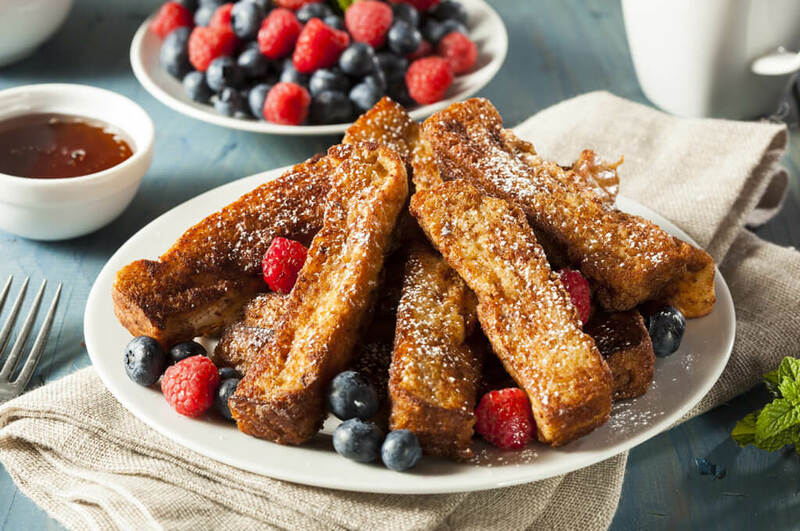 December in sunny South Africa is all about the food, and because we know you’ve had it with rushed weekday brekkies of toast and cereal, we thought you’d like to kick off your holiday with a three course pig-out of many a local’s favourite indulgent breakfast food: French toast. Kick the day off with a healthy helping of protein at the ambient Service Station in Melville. They make a mean classic style French toast with bacon and syrup that is nothing short of miraculous in your mouth. Walk it off, perhaps with a little shopping at the nearby 27 Boxes, then hop in your car and shoot straight through Richmond to get to Salvation Café at 44 Stanley in Sunnyside for a gourmet twist on the same recipe, this time featuring haloumi, cherry tomatoes, and basil pesto. Let your food digest while you get your nails done or browse the stores. Then it’s time for your last stop: desert at Licorish Bistro in Bryanston with their inventive babka French toast featuring ginger biscuit ice cream, bacon and maple syrup. Begin with a peanut butter and banana combo from Origin in De Waterkant, complete with bacon, maple syrup, crème fraîche and toasted almonds. Then burn it off with a quick workout session at Yoga Life or while walking around the Bo-Kaap museum before coasting on over to Clarkes on Bree street. Here, the famous French Toast dish is fashioned with Mrs Butterworth’s maple syrup, Nutella, and bourbon bananas. Take the scenic route to Camps Bay, where you can spend the day soaking in the sun and when it dips below the horizon, head to La Belle for some ciabatta French Toast with banana rum jam and cinnamon crème fraîche. Breakfast is at Parc in Glenwood, where the French toast is made with freshly sourced cinnamon loaf from the next-door bakery before being drizzled with vanilla poached stone fruit, lemongrass yoghurt and toasted pumpkin seeds. Then take a drive up towards Greyville, stopping at every market you can find along the way. Now that you’ve worked up an appetite, you can pull over at Freedom Café: kale never tasted this good, as a pesto on French toast with bacon jam, and grilled mushrooms. Finally, shoot straight to Ballito to get your fill of tourists, many of whom will be packed into the Delish Sisters café. And it’s not hard to guess why: they serve a delectable pecan-crusted French toast with cream cheese, berry compote and maple glaze. By now, you should have tons of Insta snaps and memories to share – and even more so if you drive a TATA, which will give these road trip adventures even more to rave about. Don’t have one? Explore these sweet deals.